Peacefully at the Treherne Personal Care Home on Sunday, February 10, 2019, Mr. Albert Cabernel of Holland, Manitoba passed away at the age of 93 years. Albert was born January 8th, 1926; the third of four boys. In addition to helping his father with the farm chores as a boy he spent many hours with his mother helping in the garden. This started his love of gardening which continued until his late 80’s until he was no longer physically able to do it. His fondest memories of the farm seemed to be stoking the steam engines in the morning before harvesting. He rarely missed an opportunity to watch them operate at the annual Threshermen’s Reunion in Austin, the last time at 89 years. He was also immensely proud of his father and uncles who operated a custom threshing operation. He had a photo of the outfit enlarged and proudly talked about it to everyone who visited him in the manor and care home. As part of the war effort at the age of 18 he worked at the Purity Flour Mill for the winter. He often spoke of the interesting people he met there and at the hotel he stayed at. He returned to the farm to help his father until his marriage to Adele Marginet on October 6th, 1953. He rented his farm on the hill from his father and partnered with two of his brothers until he purchased it in the early 1970’s. A new barn was built in 1960 for a creamery operation and a new house with actual indoor plumbing was built in 1968. They continued to work a mixed farming operation and as they got nearer to retirement; selling the cows and renting out the land until 1986 when his daughter and husband purchased it. Albert and Adele enjoyed 30 years of retirement in Holland. They took several bus trips through Western Canada and the United States, Dad’s favourite trips were to Churchill. Albert kept busy helping at the Blacksmith shop; snowblowing elderly neighbours driveways; sometimes working at local farms; and of course an impressive garden. He also loved antiques; buying a 2 cylinder John Deere and a Ford Model A custom built. It was the same as the one they had as child with the original horn used in it. They were very social, going for coffee everyday and visiting with relatives, friends and neighbours and playing cards until their late 80’s. Every week was a trip to the farm to see the grandchildren and play more cards. He loved Holland and when it was time to leave in dependant living behind he wouldn’t consider any other place to move for fear of not seeing his drinking buddies anymore. 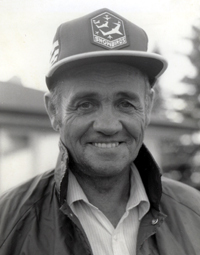 Albert also had a love of aviation and was a frequent attendee of airshows mostly at Portage la Prairie. His last show was in 2016 at the age of 90. His family also had a good chuckle when the sound of an airplane was heard; suddenly he had to run outside and check the crop behind the yard. Hard to check the crop condition when you are looking up the whole time. In his later years he spent many hours in his history books, mostly of the war. He also had an impressive tractor toy collection and several shelves of caps which were always worn, even to his final days in the care home. He loved to watch hockey and baseball, his favourite team the Boston Bruins and his favourite player Bobby Orr. He was excited to get a picture standing along side Don Cherry even if it was only a cardboard cut-out. A normally very quiet and not very talkative man, he had a wry sense of humour and there was no one who loved a good laugh more. He leaves to cherish his memory his children, Carol (Michael) Baete and David Cabernel; his grandchildren, Blair (Diane), Amanda (Matt) and Devon; and his great-grandson Cole. He also leaves to mourn, his brother Remy (Angele) Cabernel; his in-laws Marie-Louise Adam, Marguerite (Joe) Baete, Angele Fifi, Celine (Reynald) Lebeau, Robert (Jacqueline) Marginet and Annette (Albert) Wytinck; and numerous nieces and nephews, relatives and friends. He is predeceased by his beloved wife Adele (née Marginet); his parents, Aloysius and Laure Cabernel; his brothers Marcel (Julia) Cabernel and Gaston (Thérèse) Cabernel; his parents-in-law Alberic Marginet and Louise (née Hutlet); his in-laws, Alice, Roland, Raymond, Angeline Marginet, Clement Adam and Armand Fifi. Funeral Service will be held at the St. John Berchmans Catholic Church in Holland, MB on Thursday, February 14, 2019. Music and eulogy at 1:30 followed by Funeral Mass at 2 p.m. with Fr. Jose Montepeque officiating. Family interment will follow in the Holland Parish Cemetery. A Memorial Luncheon and video tribute will be held at the Holland Community Hall following the funeral. In lieu of flowers memorial donations can be made to the Tiger Hills Health Foundation, Box 130, Treherne, MB R0G 2V0.